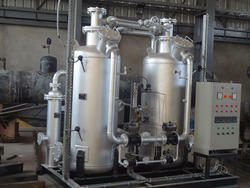 We are the leading manufacturer and trader of Internal Heated Type Dryer. We offer optimal quality Internal Heated Type Dryer which are highly efficient and accurate. Our internally heated air dryers are made up of the best quality equipments and parts. We provide our heated air dryers at competitive prices and also well within the stipulated time. We are one of the authentic heated hot air dryers exporters from india. When there is less compressed air to spare, Van Air heated regenerative compressed air dryers provide the solution by requiring less purge air for desiccant regeneration. Compared to a heatless dryer, a MOLSIEVE internally heated dryer delivers significant savings through purge air reduction. MOLSIEVE internally heated desiccant dryers supply -40°F pressure dew point air for critical requirements for pneumatic instruments, controls and sensitive process air. Principle of operation: Wet inlet air flows through the drying tower where moisture is attracted to and adsorbed on the desiccant. Approximately 6% of the dry outlet air, expanded to atmospheric pressure, is diverted to the regenerating tower where it is heated as it flows through a heater isolation tube. This air is then directed through the desiccant bed where it strips off accumulated moisture. Standard units available from 150 SCFM to 3,000 SCFM. Finally, the purge air is exhausted into the atmosphere through a purge valve. The eight-hour NEMA cycle includes four hours of drying, three hours of regeneration and one hour of cooling per tower. All AP series compressed air dryers include individual heater thermostats. Purge flow rates are adjustable for your operating requirements.